Books for kids that are all about construction trucks have dominated our reading stack for most of this year! We have read lots and lots construction books for kids. Some of them my kids have memorized and others have been memorized my Mommy and Daddy against our will! If you have a construction crazed little one in your life, this list is for you! It’s a handy list to have on hand for a birthday, holiday gifts, or a unit on transportation. Full Disclosure: This post contains affiliate links. A copy of Backhoe Joe was provided for review. All opinions expressed are my own. My kids adore Construction Kitties by Judy Sue Goodwin Sturges. In fact, they have it memorized. The kitties start their day as the sun rises. They spend the day working the construction vehicles only to stop for a yummy lunch of sardines and milk. At the end of the day, they admire their playground creation. Builder Goose It’s Construction Rhyme Time! by Boni Ashburn is a fun board book for youngest construction vehicle fans. How about “Bump! Bump! Wheelbarrow” to the tune “Baa, Baa, Black Sheep”! Eighteen rhymes to keep you singing and chanting. Construction by Sally Sutton will be under the Christmas tree for my 2-year-old this year. We love all of Sutton’s books and I know my son will love this one too. The construction vehicles are busy building a LIBRARY! If you need another Sutton recommendation, my son would tell you to get Demolition! The Little Dump Truck by Margery Cuyler takes us on the journey of Hard Hat Pete and his dump truck for a day at work. This one ends up in our weekly rotation of bedtime reads. Work, Dogs, Work: A Highway Tail by James Horvath is the latest dog book. In this “tail” the dogs are building a new road to the beach. They need lots of big construction machines to help them with their work. My boys love Horvath’s books including Dig, Dogs, Dig and Build, Dogs, Build. Don’t forget to look for the black cat on each page! For a coloring sheet of Backhoe Joe, you can visit Lori’s author site. If you are looking for another newer release, check out Go! Go! Go! Stop! by Charise Mericle Harper. A little green dot has just learned to say, “go” and he is getting all the trucks working in the town. Then, in rolls red dot and starts saying, “stop”. Well, the trucks get a bit confused. Green and red have to learn to work together to make sure everything runs smoothly. And, guess who rolls into town at the end? Goodnight, Goodnight, Construction Site by Sherri Duskey Rinker is a sweet story about the construction vehicles ending their work day and preparing for sleep. The words and illustrations are soothing and make a comforting bedtime story. B is for Bulldozer by June Sobel is another beautifully illustrated book that walks you through the alphabet and takes you on a tour of the construction site. If you are looking of a construction book that you won’t get sick of reading countless times, check out The Diggers Are Coming by Susan Stegall. The rhythm in this book makes it so much fun to read. It’s a great one for building vocabulary. Construction Countdown by K.C. Olson takes you on a countdown from ten to one. I’m not a big fan of the illustrations, but my kids really liked the book. If you have a dinosaur lover in addition to a construction truck lover, then Dinosaur Dig! by Penny Dale is the ticket. We enjoy all of Dale’s books and the idea of dinosaurs operating the big machines is just fun! Digger, Dozer, Dumper by Hope Vestergaard would be at the towards the top of our construction truck book list favorites. It’s full of 16 rhyming poems which make it a great introduction to poetry for young children. There are a few trucks that aren’t construction vehicles in this book, but we just had to include it. We highly recommend this one! The Construction Crew by Lynn Meltzer is a simple book with brief text. But, the bold illustrations thrill young construction truck lovers. Diggers Go by Steve Light is a perfect board book for any little one who loves to make truck noises. Practice all the sounds you would hear at a construction site. The bold and bright illustrations of Machines at Work by Byron Barton is perfect for young readers. The simple rhythmic text guides you through the many jobs of the machines on a construction site. Phew, that list should keep you busy reading for awhile! Check out some of our other popular books for kids lists. P.S. 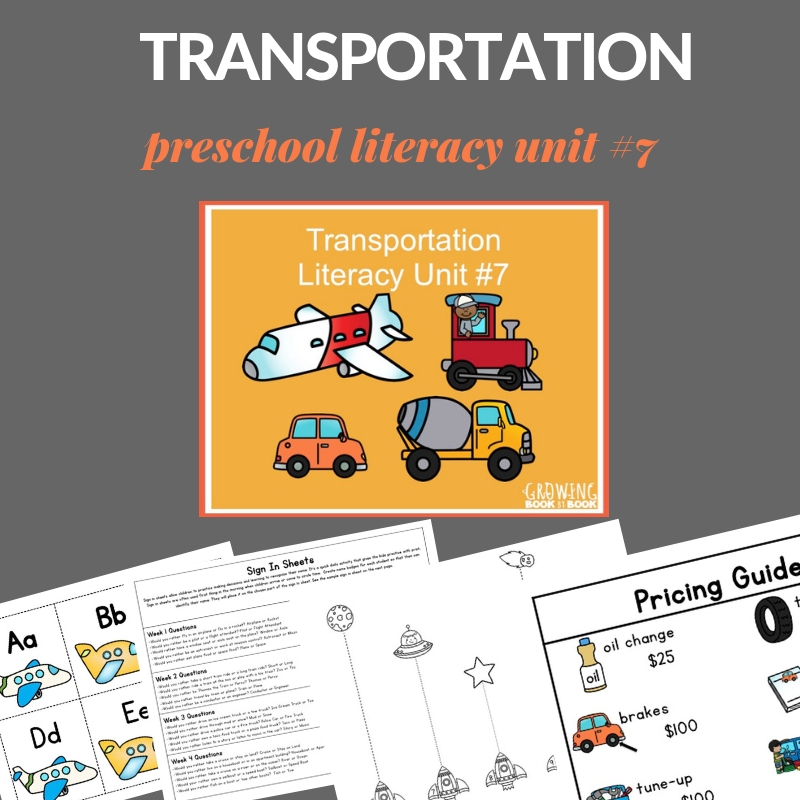 Grab the Transportation Preschool Literacy Unit for more transportation fun and learning. Wow! Our minds were on the same track this week! Look what I just posted: http://mommynificent.com/2014/12/17/board-books-cars-trucks-little-ones/ One I would definitely add to your collection as soon as you can is Sing-Along Construction Song by Louise Lintvelt. We love it! Thanks for sharing this at Booknificent Thursday! Merry Christmas! Thanks for the idea Tina! Most of these are new to me, I’ll have to look for them at the library! Thanks for linking up at the Thoughtful Spot Weekly Blog Hop! We hope you stop by again next week! That is a great one Jill! I have a great grandson and am searching for book like this. Wonderful selection. Have a couple for him, but more to look at. Thanks for sharing! Thanks so much Pat! Glad the list gave you some ideas.